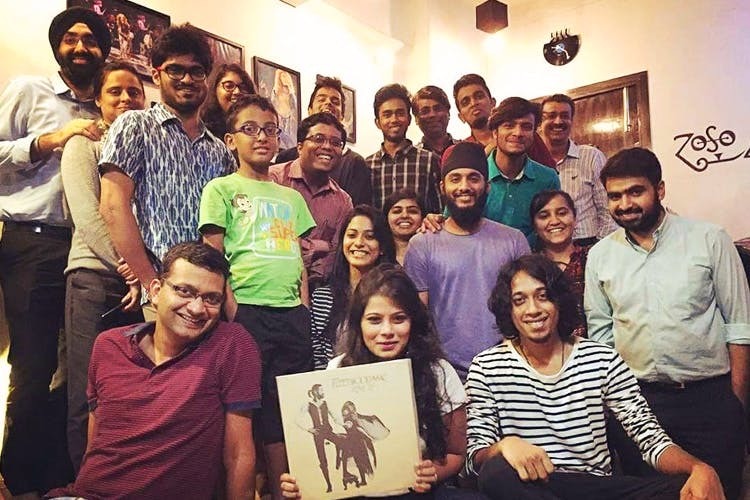 A music school in Chembur, Adagio, has been organising Thursday Vinyl Nights with a theme, and it’s perfect for anyone who’s looking to immerse themselves into old-school music. However, what really fascinates us are the blissful vinyl nights they organise every Thursday. Imagine a room full of music lovers listening to an entire album with no lights, no phones and no distractions. That’s what a typical Thursday Vinyl Night at Adagio looks like. It was started off in November 2016 with an intention to wholly dedicate a night to pure unadulterated form of music. Aman Singh Gujral, founder of Adagio tells us the idea is to bring back the magic of vinyls. And the magic is alive as every Thursday they get at least 30 odd people depending on the popularity of the album playing that night. The idea that one can just sit and listen to the entire album in a dark room with people who love music as much as you do. For the month of July, the theme is Pink Floyd and the albums that have been lined up include: Animal, Wall, Wish You Were Here and Dark Side of The Moon. The session starts at 8.30pm, however people can come in earlier and browse through the records and albums covers. Most of these vinyl records have been collected by Aman over the past seven-eight years and he is more than happy to share them with more people. Once the sessions is done, people can discuss the album and form smaller groups and socialise. It’s a great place to connect with fellow musicians or just unwind for those few hours and throw yourself into a room full of strangers connected by that one album. The Thursday Vinyl Nights are great way to socialise if music is your common interest. An entire album is played at each of these sessions, and they also welcome suggestions for the coming months. Find the upcoming event on Houses of the Holy by Led Zeppelin on Facebook here. All of these listening sessions are free and open to everyone. Get in touch with Aman on 9930008054, or here.